Status: Eliminated by Nasim Pedrad in Round 3 (2013)! 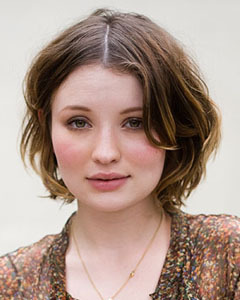 Emily Browning is a charming actress who played the lead character, Babydoll, in Zack Snyder‘s Sucker Punch. But, you may recognize her as the little Violet in Lemony Snicket’s A Series of Unfortunate Events. She also played the lead in the chilling horror film The Uninvited. She is currently cast as the role of Flavia in the upcoming ancient-period film Pompii set to release in 2014. Emily began her acting career at age eight and got her first big break in the Hallmark Channel’s movie The Echo of Thunder. She has two younger brothers. Interestingly enough, she is one of four actresses born in Melbourne, Australia, making Melbourne the most frequent birthplace of Girlfriend Bracket contestants! Check out her interview with AMC!